Suppressor Heat and Sound Insulating Mats by Thermo-Tec are ideal for the customer who needs both sound insulation and radiant heat control. 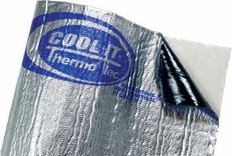 Thermo-Tec has combined a 70 mil thick polyethylene film with a radiant heat reflecting foil surface to provide a fast and effective way to achieve both goals in a simple peel and stick application. The Suppressor Heat and Sound Insulating Mat is ideal for firewalls, under floorboards, trunks, doors, as well as countless marine and industrial applications. The part number for this item is 14620 and it measures 36" x 60". It can easily be cut with a razor knife to any desired size(s).